Art at the Institute is pleased to host Five Elements of War, an installation of multimedia artworks by Ukrainian artist-activists Daria Marchenko and Daniel Green depicting their critical commentary on and reaction to the recognized causes, turmoil and consequences of the ongoing Russian military aggression and war waged in eastern Ukraine. Underwritten and presented by Raymond F. Staples, Esq., Five Elements of War was arranged and organized for display at The Ukrainian Institute of America by Walter Hoydysh, PhD, director of Art at the Institute. While the installation’s artworks are clearly political, most compelling is their material nature. The artists incorporate found objects including shell casings, documents and shrapnel, all gathered from the war’s front lines. They emerge as “metaphysical images,” meant to evoke a visceral — in your face — unrepeatable and purely original reaction in the viewer. 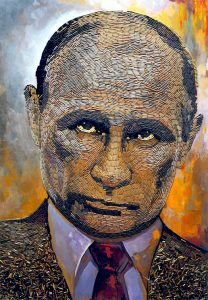 The exhibition’s iconic piece, the seven-foot high “The Face of War” (2015), unapologetically depicts the figure behind the calculated conflict in Ukraine — Russian president Vladimir Putin. It is cleverly created out of five thousand bullet casings gathered at the battlefront in Donbas. Depending on the play of light in the exhibition space, the “mood” of the piece changes. The “portrait” unveils a wide spectrum of emotions, from emphasizing developing socio-political complexities, Russian propaganda and lies generated of the conflict, to generalities of human nature in the time of war. Daria Marchenko and Daniel Green, The Face of War, 2015, 94½ x 67 inches, oil, acrylic and shell casings on board. The remainder of the series consists of the following artworks: “The Brain of War,” “The Flesh of War,” “The Heart of War,” and “Honor.” Speaking to a different deep-seated aspect of the war, each work stands independently, but is, at the same time, conceptually joined to the other pieces, forming an overall thematic composition throughout. Daria Marchenko hails from Kyiv, Ukraine, where she attended and graduated from the Kyiv National University of Technologies and Design. Her artworks have been exhibited in Ukraine, Western Europe and the Middle East. A successful commercial artist, Ms. Marchenko is most known for her involvement as an advocate for public art in Ukraine, and the creation of both interior and exterior wall murals in over thirty countries. Daniel Green is a Ukraine-born painter, sculptor, and installation artist. He is a graduate of the Kyiv State Secondary Art School of Painting, and a member of the Professional Union of Artists of Ukraine. He has participated in numerous group and solo exhibitions in Ukraine and abroad. Five Elements of War was previously exhibited at M17 Gallery (Kyiv), the Rayburn House Office Building (Washington, D.C.), and, most recently at The Ukrainian Institute of Modern Art (Chicago). Exhibition hours: Tuesday to Sunday, 12:00 – 6:00 PM, or by appointment. The Ukrainian Institute of America thanks Raymond F. Staples, Esq., Self-Reliance NY Federal Credit Union and JRC Management Co. for their generous support in making this exhibition possible.